Paspalum quadrifarium is a coarse perennial grass, 2 m high, growing in large bluish-green bunches. Rhizome short, stem compact. Leaves with longitudinal prominence on the back, 15-40 cm long and 5-8 cm wide. Inflorescence in clusters of 40, rust coloured, 12-30 cm long. Flowers and seeds produced twice a year. Native to Uruguay, Argentina and Southern Brazil, declared as a noxious weed in Australia, Southeastern United States and coastal Italy. 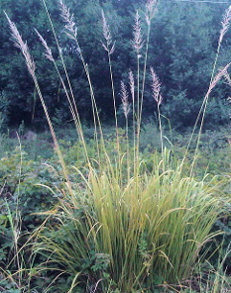 Tussock paspalum was probably introduced in South Africa as an ornamental and horticultural grass. It has been recorded in KwaZulu-Natal, from the Melmoth area along N2 between Kokstad and Port Shepstone and along R56 in Richmond and Pietermaritzburg. Tussock paspalum spreads rapidly through rhizomes and seeds. Tussock paspalum is an aggressive grass which forms dense infestations. Rhizomes spread horizontally and produce suckers, which form a large dense clump, thus outcompeting native plants. Invades river banks, lake shores, roadsides, valleys and agricultural plantations. Tussock paspalum is currently controlled by uprooting. There are no herbicides registered for this species in South Africa.